Cast of a Kanawha point from Illinois. 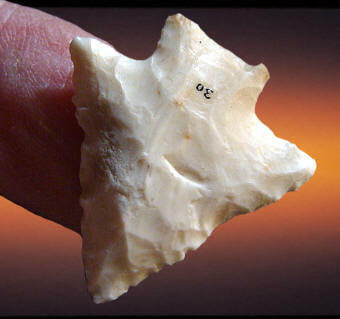 This point type dates to the early Archaic period approximately 8,000 years ago. It's found just about everywhere LeCroy points are found in the eastern United States. Kanawha points are similar to Fox Valley and Clipped Wing points. This point is bifacially flaked but much of the opposite side is the original flake surface. It was found several years ago by Gene Gray in Montgomery County, Illinois. This point is made of white Burlington chert and it measures 1 1/8 inches long.